See how pointed and sharp the corners of this first place wrestling metal are? Hold that thought. Thank you for the get well wishes for my husband. He still has groin and hernia pain but he is happily limping around and getting better by the moment. He went to school last night to coach, and he went back to work today for a half day. His spirits are such that despite any odd shooting pain he may feel, he is joyful because of the relief in having the hard parts over. 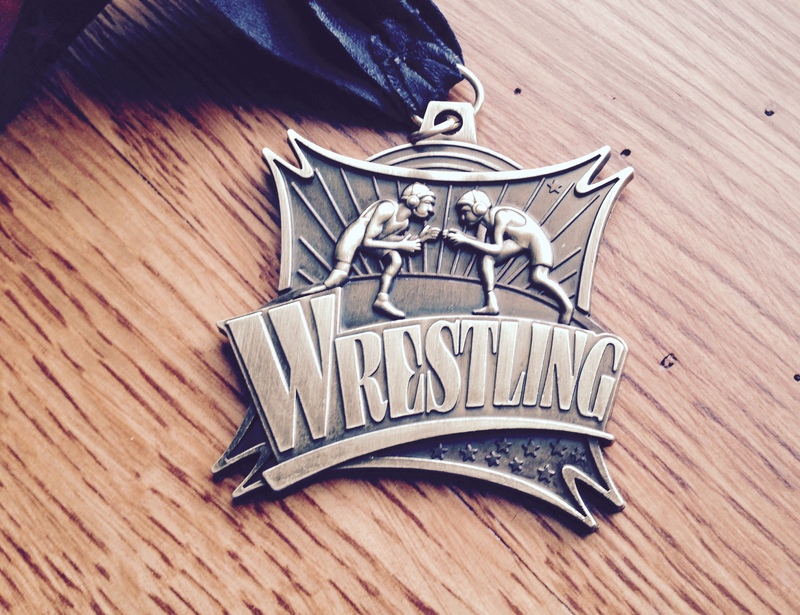 Somewhat ironically, on Saturday and Sunday when their Dad was recovering from his wrestling injury, all five of our sons were participating in wrestling tournaments. 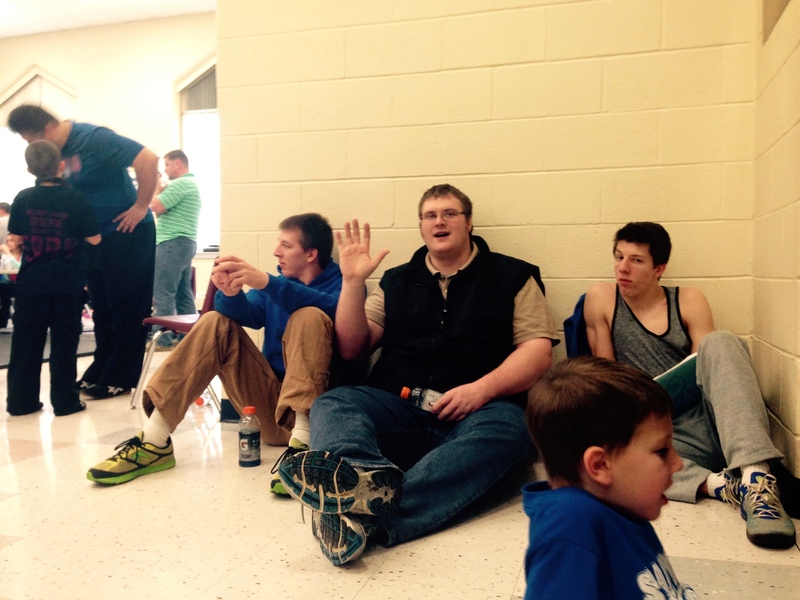 Uncle Jason watched Jacob and Ethan both win their weight classes in the J.V. tournament on Saturday, while Rich and I were waiting to leave the hospital. 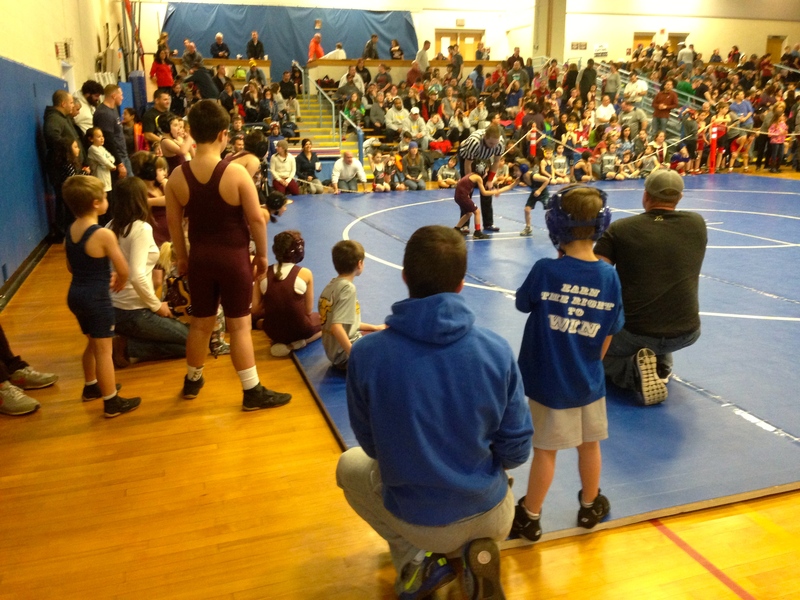 On Sunday, I left Rich at home with the girls and drove an hour away to watch David (12), Caleb (9), and Seth (5), each wrestle in their first tournament of the season. Ethan was there as an assistant coach. The school was loud and hot. I was thankful for my tank top that I wore layered under a sweatshirt. I was thankful for the concession stand so I didn’t have to be concerned about food and drink. I was thankful for the bathrooms everywhere. I was also thankful that Jacob and Michael came later on in the morning, to watch with me. Finally, I was thankful that Sarah Joy was at home with Rich and Grace. Seth was adorable. He had been itching to wrestle for over a year. Last year he was a spectator of his older brothers. Now he is finally an athlete on the team and he smiled the entire time. He was a joy to watch, in fact, I got a little sentimental at times watching him. This is the video of his first match ever. 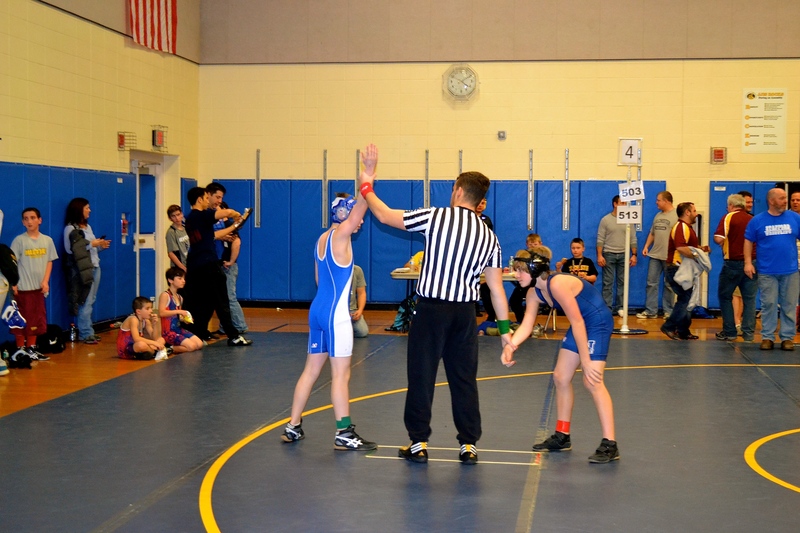 I started taping right at the starting whistle and Seth immediately pounced on his opponent. 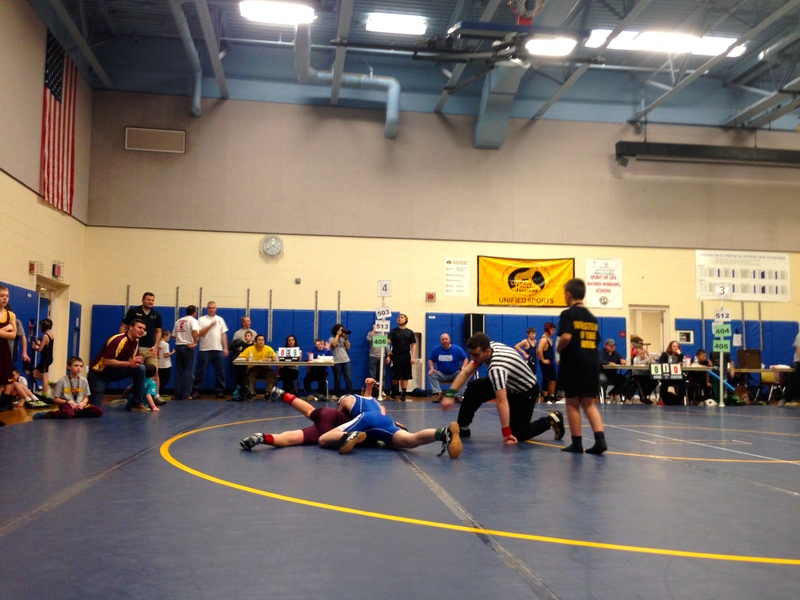 Caleb’s group wrestled in the morning, too, and he did well but lost each match. Over several hours, Caleb wrestled three times, and Seth wrestled four times. 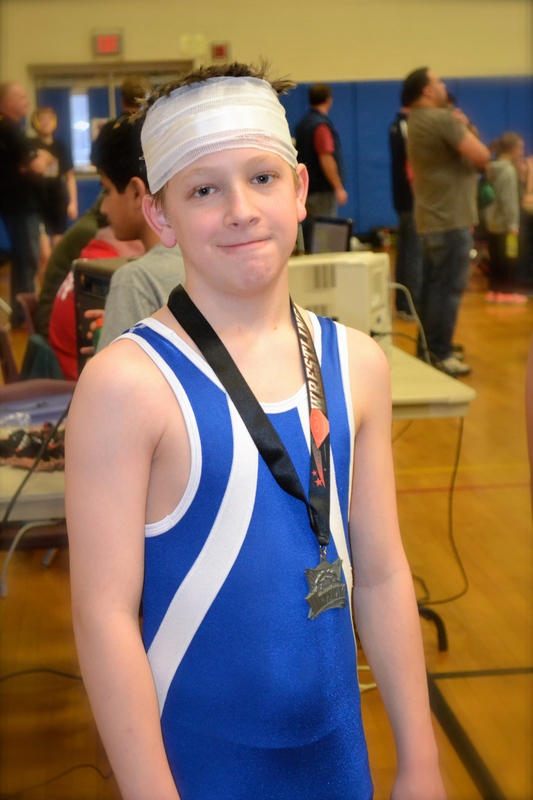 I am happy to announce that little Seth ended up winning all of his matches and was given a first place metal. 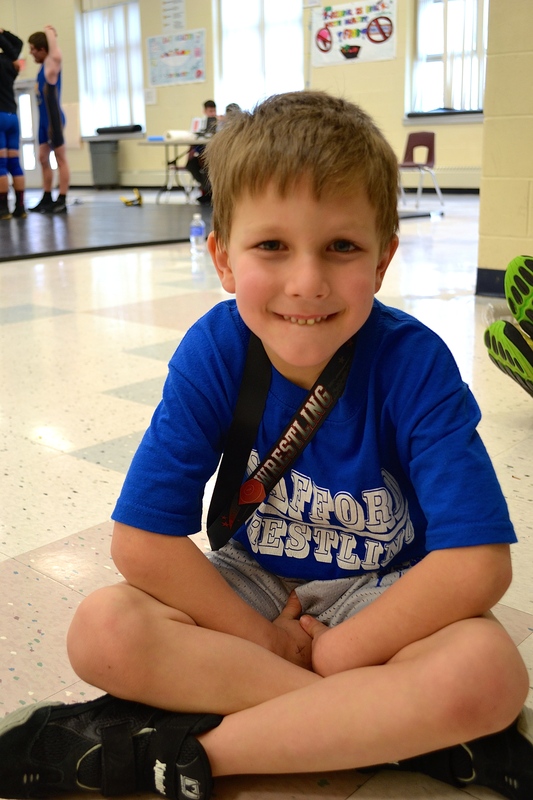 He said, “I knew I was a good wrestler!” and then later on, “I wish Dad was here!” He was as proud as a peacock and I was, too. He never got tired. In fact, he never stopped moving. He was so active that at times I sent him over to hang around with coach, so I didn’t have to defend myself any longer. 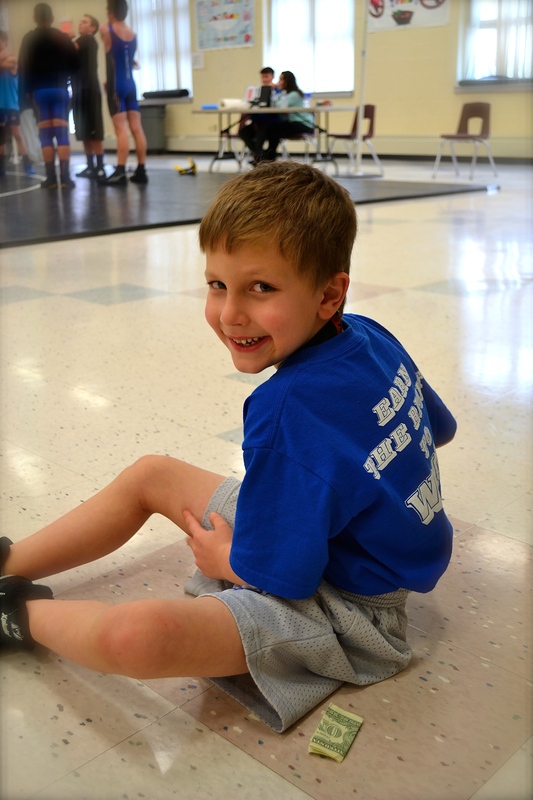 He wrestled everything that day; the wall, the floor, his mom, his teammates, his coach, his brothers……. Dave and I were talking, sitting cross legged on the floor. Seth was hanging around, swinging his metal (see first photo) when suddenly it accidently bounced sharply off the back of Dave’s unsuspecting head. (Seth felt terrible). We immediately stood up and when Dave looked at his hand after holding the back of his head, it was covered.in.blood, my friends. Blood dripped down. I rushed for the paper towels…….poor Dave could not see the wound so he was scared, but after cleaning him up and looking at it we knew that he was okay to continue wrestling, it was a only a very small cut. Coach and I took Seth’s metal away from him. David was a wreck. He was upset, pale, and had to struggle to hold back tears. My heart sank. 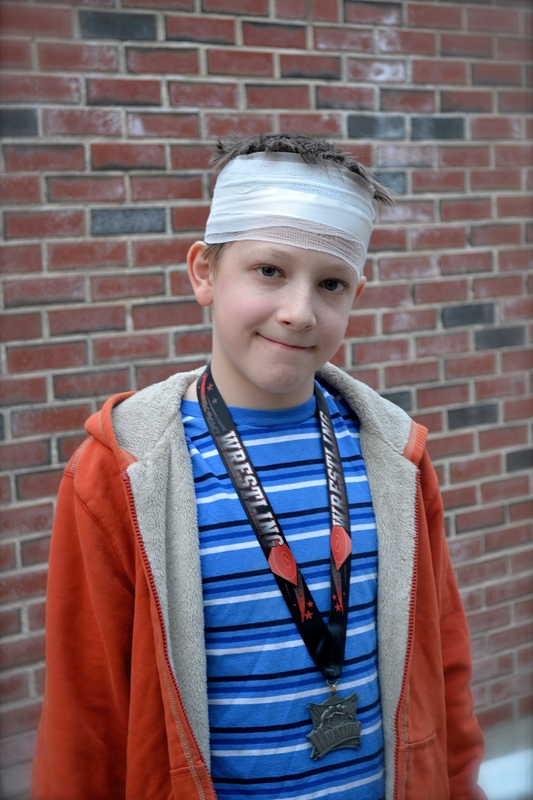 He lost his first match, and in the midst of it, they had to stop and wrap his head all up in gauze to stop the bleeding. He felt so self conscious and foolish that right after losing, he went in the hall to hide. I went out to find him and encouraged him to use his feelings to be aggressive, rather than give up. I told him I was proud of him. His coach did a great job of motivating him, too, and I went back to the stands to wait for his next match. He fought hard and to my surprise, won it. Coach didn’t know where I was, so when I went to the team to congratulate Dave, he said, “Did you see David? I couldn’t find you! He did great!” I had watched it all from the stands, sort of hiding, myself. And, to make a perfect ending to a crazy-day, he also won his third and final match. The relief was visible on his face, and he went to collect his hard-earned metal. Well done, my son. You are well on your way to impressive manhood. 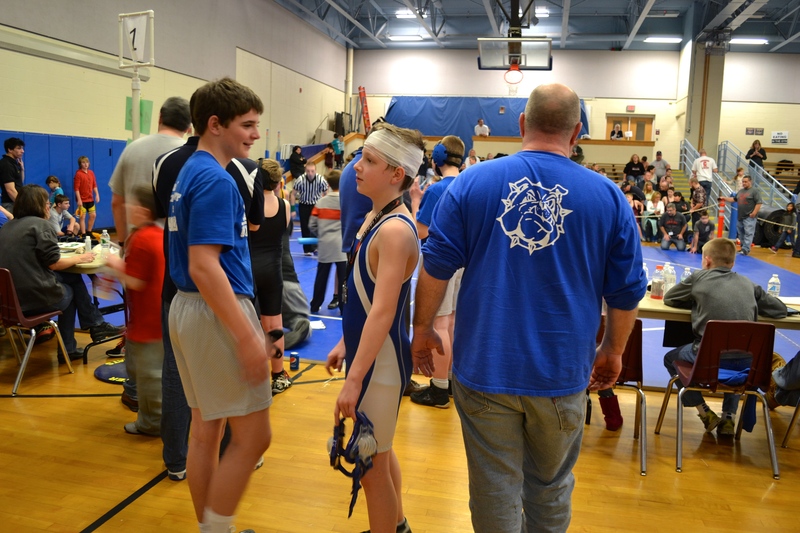 The wrestling for our family was done, but we stuck around to watch just a few more teammates. Mike took the other boys in his car, so Dave and I had the car to ourselves. We stopped at Dunkin’ Donuts on the way, and he read a book while I listened to the radio and drove us back home again. It had been an exciting day. To say the least. I was rather tired of all the excitement, to tell the truth. How thankful I am for a loving heavenly Father. We can trust Him completely with every moment of our lives, so that even during busy seasons of life, a peace that passes all understanding is there from above to nurture us along. He gets all the glory for everything and always and His loving hand is so blessedly and obviously underneath us all, holding and loving us, even during the most difficult of times. This entry was posted in family, life with boys, milestones and tagged david, seth, wrestling by Shanda. Bookmark the permalink. Oh my goodness…the video of Seth is so cute! My kids watched it with me. 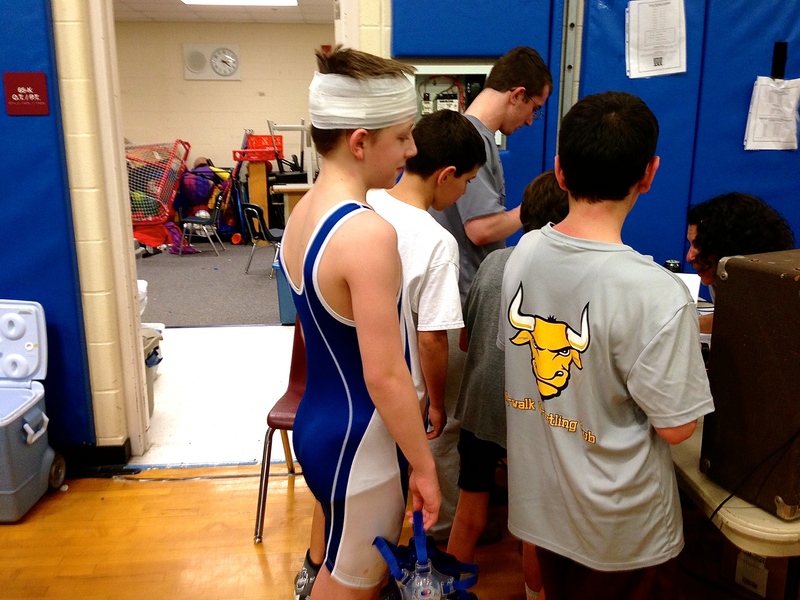 Glad David’s head is okay…I’m sure getting hit right before his match was a bit discouraging. I haven’t heard about any punches at this time. 🙂 Thanks, liz! Wow, what a week you have had. I hope the next one brings less excitement. Congrats to all of your boys, though, for their hard work. Hi Christie….personally, I am ready for a few slow days. We are all tired tonight. We’ve spent a few hours watching episodes of the Waltons together. (but Rich, J, and E are at another wrestling event)…. So sorry to hear that your husband had to have surgery but happy to hear he is on the mend. Your boys are so cute and what a great job wrestling! I remember those days of running here and there for soccer meets, basketball games and cross country — my boys never wrestled (as a sport!) so I don’t know much about that but it looks like your boys are doing a fine job! Enjoy this season of your life — it all goes soooooo fast! Thank you for the reminds to enjoy the season, Jo-ANN! I hope you and your husband are well, I’ve been thinking of you because I was reading an older post the other day and saw one of your comments! Much love!